The #1 complaint I hear about Facebook video is that its hard to find videos. On YouTube you count on three things: search, video recommendations on the front page and sidebar, the auto-play feature when you finish watching a video, and subscribing to your favorite channels. All of those are supported by an algorithm optimized to increase viewing time, because they want you to watch for long periods of time. Facebook search isn’t useful for finding specific videos and its discover page is lacking, but is Facebook struggling to get video views and engagement because of their utter disregard of discovery features? That’s a big NO. On the contrary people are watching more than 100 million of video on a daily basis on Facebook and it continues being the most engaged platform. That’s because Facebook wants you to keep on scrolling. So how are people watching videos? Through their feed shared by their friends and pages they follow. YouTube is a platform ruled by discoverability, no one can share a YouTube link on YouTube on a personalized feed, you are almost entirely dependent on the algorithm. Facebook on the other hand is a platform ruled by distribution. Sure there is an algorithm that dictates what the ranking of what people see on their feed, but the algorithm is not the end all and be all. 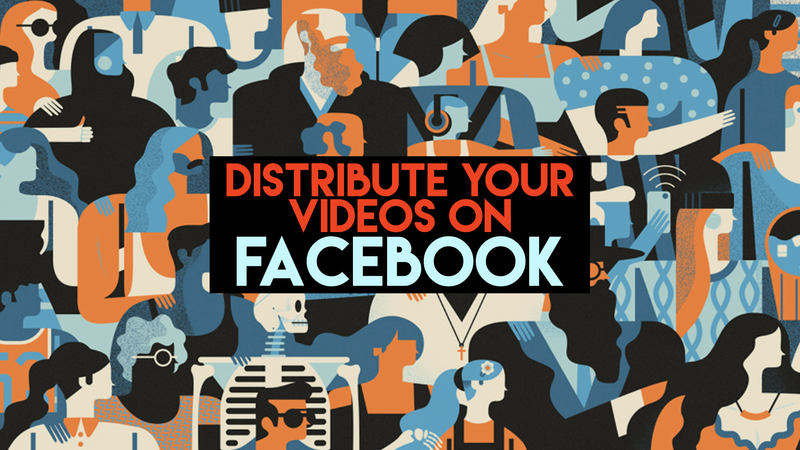 Videos spread on Facebook because people share them and the power to distribute those videos are in your hands. Have you’ve ever wondered why you might see a Vox video in the NowThis page? It’s because they’re distributing their videos. Distribution is not new to media, but Facebook is opening up the ability for everyone to distribute their content. How do you distribute your videos? It’s simple. Coordinate with major pages and groups to share your page’s videos. All you have to do is ask for a share of your video. Yes, you can do that. You don’t need personal connections or to offer compensation — though those might help in certain situations — all you need is to share a video that brings value to that page’s audience. Choose a video that provides value to a viewer that might not know about your page yet. Reach out to pages or groups via Facebook Message or email and ask for a share. It’s important that you’re bringing some type of value to the page by them sharing your video, mostly with the engagement they’ll receive from it and the value it’ll bring to their viewers. In my case with Urbanist major media pages share my videos because I teach their viewers about NYC history and they get large amounts of engagement due to the nature of my live videos. If they share, then be sure to reply to all comments on the share. When more likes start rolling in because of the share, be sure to invite everyone to like the page. If you get no response, consider following up with a different video in 2–3 weeks. What makes a video sharable? If the video provides some type of value to the viewer, then it’s sharable as long as you find the appropriate page or group to share it with! Tips, inside looks, behind-the-scenes, fascinating stories, history, current news, humor, product reviews, case studies are all great examples of the value a video can provide to an audience. Keep this in mind as you seek who to reach out to. Facebook Message — with pages, message them directly. With groups, message the admin. Email — you can find the contact info sometimes in the page or directly on their website. Aim for emailing their Social Media Manager (hint: you can find out who that is by a simple LinkedIn search). Who should I reach out to? Find pages/groups who already post similar content to the video you’d like to share. For example if you’re sharing a video about the Empire State Building, then consider reaching out to the official Empire State Building page along with other major travel pages. Stick to large pages and very active groups. Why? Larger pages are more likely to share and are your best bet for getting as many eyes on the video as possible. I’d recommend sticking to pages with more 100K followers. Highly active groups with more than 1K members are a great outlet for distribution. Groups on Facebook tend to be highly active and members tend to share content on groups on a higher rate. Influencers. Depending on the video you post, see if there are any influencers in that space and if they’re willing to share. What message should I send? I know for some the thought of sending a cold-message is nerve-inducing, so I’ll provide you with a script that has worked for me in getting 1.8M views organically on Urbanist in only 6 months. Briefly describing the video and asking if they can share to their page. Letting them know that their followers would love the video because of so-and-so reason. I hope all is well! My name is Ariel Viera, and I’m the social media manager for Urbanist. We’ve recently been posting videos about popular artist and have received unprecedented levels of engagement. Today we covered the life of Frida Kahlo, which I think your followers would love to see! I’d love to see if we could coordinate a reshare from our page to yours? Personalize this message in your own voice. The one thing to keep in mind when contacting anyone is what value can you give to them and their audience and make the process to share as easy as possible, hence providing a direct link is crucial. Remember that sharing content on Facebook is beneficial for everyone, because more engagement and valuable content on a page is a good thing for the page itself and the viewers. Of course you may encounter some pages who disagree, but the majority do. If they don’t respond, then assume they didn’t manage to see the message and feel free to follow-up in 2–3 weeks with a different video. Reiterate what you said on the initial message. I usually only follow up a maximum of 2 more times. WARNING: Don’t spam! Always send a personalized message, not just rapid fire copy+pasting. It’s annoying and may result in Facebook banning your account. What if they ask for a share in return? Many major publications might ask for a share of their content in return. This is a great starting point in starting a fruitful media partnership! What benefits should I expect when distributing my videos? Facebook pushes video more aggressively than any other content type. More likes on your page. Once your videos get shared, be sure to engage with every new commenter. That is the best way to increase engagement in the long-term. If you have any questions, feel free to let me know in comments! Thank you for reading! If you like this post, hit that ❤️ button. It’ll be a huge help in getting others to see this post as well. :) You can also find me on Twitter and Instagram.